Libby is super cute and fun and all the boys love her! That makes Libby’s Boyfriend Sweater a real eye-grabber. The diagonal hem, asymmetric stylings and oversized look make Libby look spontaneous! Knit this fun pattern today. Gauge: 18 sts and 24 rows to 4” in stockinette stitch. 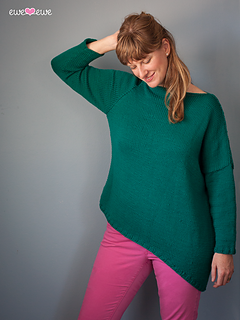 Note: The Libby’s Boyfriend Sweater is knit in four easy pieces and seamed. The front and back are mirror images of one another. The front and back are knit from the top down. 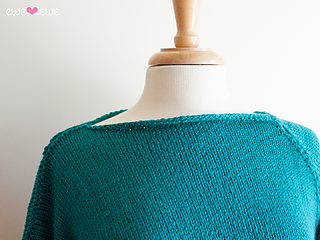 Stitches for the dropped sleeve are picked up along the side edge of the sweater. 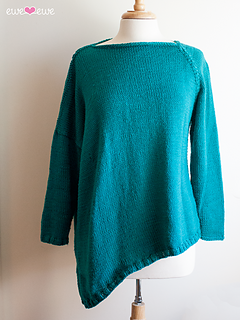 The raglan sleeve is knit as a separate piece and sewn in.